Detroit, Michigan – (July 29, 2016) –Rockin' the Shores Beer & Music Festival presented by Roy O'Brien Ford, Inc. will be taking place at 9 Mile Road & Mack Avenue in beautiful downtown St. Clair Shores on Saturday, Sept 17, 2016. Hundreds of bicyclists are expected to kick off the event with a 7-8 mile bicycle ride to benefit Kids Without Cancer. The Nautical Ride to Rockin’ the Shores will start at 11:00 a.m. Participants who pre-register will receive a ticket to the festival, a limited edition t-shirt, and 15 beer sampling tickets. Tickets are available at Roy O’Brien Ford located at 22201 Nine Mile Road, St. Clair Shores, MI 48080. Starting at 1:00 p.m. Atwater Brewery will host a celebratory Oktoberfest style tapping of the keg. There will be a variety of craft beer, including specialty brews just for the event, from Atwater Brewery and St. Clair Shores local favorite Baffin Brewing Company. The event will feature some of Michigan’s finest bands. Kicking off music on the main stage at 3:30pm is the incredible Stone Clover, a Detroit favorite Irish Rock n' Roll band, The Muggs, an internationally renowned American blues rock band from Detroit, singer/songwriter Brian Vander Ark from THE VERVE PIPE best known for his hits, “The Freshman” and “Photograph” and Detroit’s legendary home brewed rockers, SPONGE, known for their top 10 hits “Plowed”, “Molly (16 Candles Down the Drain)” and “Have you Seen Mary?” will headline the event. SPONGE featuring proud St. Clair Shores resident Vinnie Dombroski (vocals), Billy Adams (drums), Tim Patalan (bass), Kyle Neely and Andy Patalan (guitar). The band recently released the band’s eighth studio record “The Beer Sessions”. The first 300 people to buy tickets to the event will receive a FREE Beer Sessions CD. 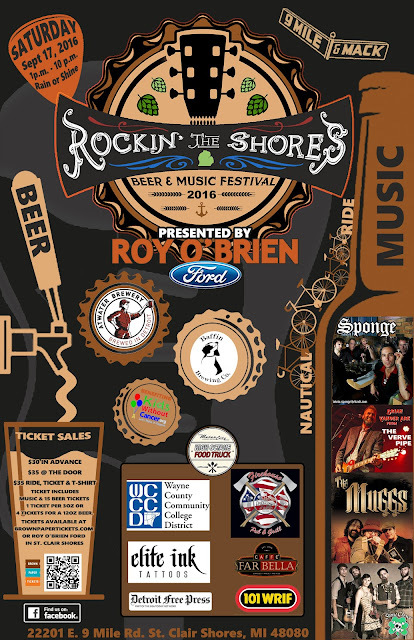 The night of the festival, the band will be recording a brand new live cd to be named “Rockin’ the Shores LIVE”. In addition to great music and beer, there will be a variety of food from local business and MotorCity Casino Hotel's High Octane Food Truck. Guests will also get to participating in games and shop in the beer vender village. A portion of the evening’s proceeds will benefit Kids Without Cancer. Founded as Leukemia, Research, Life (LRL) in 1981 and renamed Kids Without Cancer in 2011, this remarkable organization has, for thirty years, been raising money to fund the pediatric cancer research being done at Children’s Hospital of Michigan and its affiliates Wayne State University and the Karmanos Cancer Institute. In fact, this organization is proud to be the largest contributor of funds to pediatric cancer research at Children’s Hospital of all charities solely dedicated to funding cancer research. Rockin’ the Shores couldn’t be possible without support from Roy O’Brien Ford, the 9 and Mack Business Association, Elite Ink Tattoos, Wayne County Community College and Motor City Casino Hotel’s High Octane Food Truck.Family owned and operated since 1946, Roy O'Brien Ford is located at 22201 E. 9 Mile Rd. St. Clair Shores, MI 48080 for all your Metro Detroit Ford Vehicle needs. Stay on the right track to Nine Mile and Mack!